Real estate technophiles who believe they have the next brilliant startup idea have a new opportunity to nurture their dream. 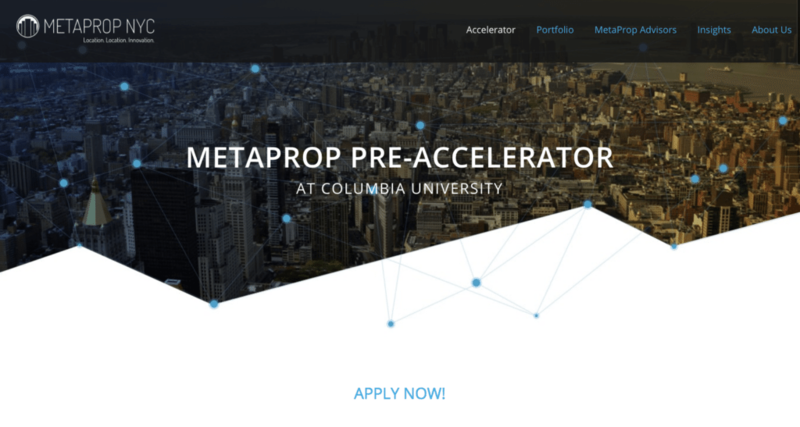 MetaProp NYC, a Manhattan-based real estate technology accelerator, today launched the eight-week MetaProp Pre-Accelerator program for the proptech sector, in conjunction with Columbia University’s Columbia Center for Urban Real Estate. MetaProp NYC is taking applications for the program until April 30. Pre-accelerators tailor to aspiring entrepreneurs, those in the “idea” stage and future product launchers who are preparing to join a full startup accelerator program. “This is a unique opportunity for early stage, pre-seed PropTech ventures to access extraordinary talent and resources from Columbia and beyond, as well as advice and mentoring from MetaProp NYC, the foremost authority in real estate technology acceleration,” said Aaron Block, MetaProp NYC’s Founding Partner and Managing Director in a statement. “We at the Center for Urban Real Estate, working with Columbia Entrepreneurship, are thrilled to partner with MetaProp in this endeavor,” said Dr. Patrice Derrington, Holliday Professor of Real Estate, Director of CURE, GSAPP, Columbia University in a statement. “The pre-accelerator represents an extraordinary opportunity for early stage founders with a focus on advancing technology applied to the built world and emerging from Columbia University’s rich technology ecosystem, to work on [proptech] startup ideas and to receive high-level mentorship and training from the [proptech] and Columbia networks. MetaProp NYC’s 2016 accelerator class included a lease-flipping marketplace, startups innovating in the HVAC space and a company that helps turn landlords into fitness class hosts. The accelerator program provides funding and mentorship in exchange for equity.